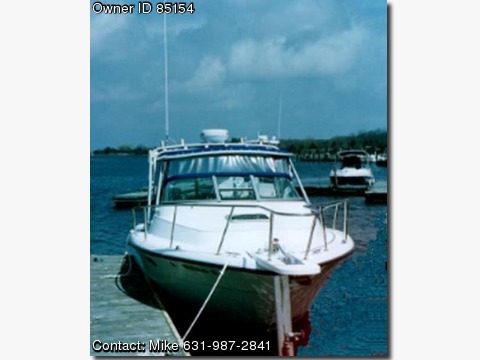 1989 Pursuit Model 2650, Powered by twin 2002 200hp Johnson Ocean Runners, Call Mike @ 631-987- 2841. OVERVIEW: For the size of this boat it handles large swells easily here off the Montauk Point, She is very easy to handle and can be used either for fishing, cruising or for any sort of family fun, I have a ten year old daughter who would invite her friends on board, and they had a blast tubing and inshore fishing and swimming off the aft, It really is a perfect boat for a family and includes a new AM/FM/CASSETTE stereo radio, The engines have been yard maintained and purr like 2 kittens, She is sitting on a dual axle trailer, however for my convenience I kept her docked at the local marina. LAYOUT & FEATURES: All electronics are Raymarine and the boat was rewired 4 years ago, I really hate to sell her but I am a disabled American veteran and it is hard on my hips and back, She holds 240 gallons of fuel, 120 each on the port and starboard sides, Her cruising range is quite astonishing, especially when the engines are running around 3500 rpms, At that level she cruises at 26 knots per hour, Down below she has a stand up head, small fridge, one burner electric stove , plenty of storage, She sleeps three very comfortably, as the V berth is expandable by moving the dining table, All the covers have been totally redone, Electronics include 3 way radar system, gps, depth and fish finder, cb radio, The radar can be split into 3 screens so actually she has 2 gps systems and 2 depth finders, I , being a Naval Academy man class of 1973 have always made sure to have backup systems if needed, Other things that are on board are too much to list so please call for all the details. Questions, call me @ 631-987-2841.